The world's biggest investment banks colluded to stop competition in a profitable derivatives business according to EU authorities. 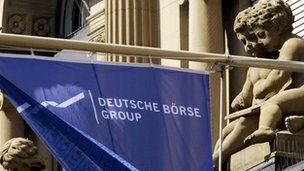 Between 2006 and 2009 Deutsche Borse and the Chicago Mercantile Exchange tried to enter the credit derivatives business, but were denied licences to offer trading in the products. EU competition officials say that big banks were behind that refusal. If the exchanges had been successful, banks may have lost out on business. The report focuses on one particular financial product, the credit default swap (CDS), which is dominated by "over-the-counter" trading - trading provided directly by the big banks, instead of via a financial exchange. CDS are used by companies and investors to protect themselves against potential losses from a debt going bad, or to speculate on the probability of a company or government going bust. They were much talked about during the European debt crisis when bailouts caused steep losses for holders of Greek debt. They were also accused of helping to propagate the 2008 financial crisis, particular when the large insurance company AIG, a major writer of CDS contracts, almost went bust. Following the financial crisis, regulators in the US and Europe have been seeking to move trading of derivatives onto exchanges in order to reduce the risk of counterparties failing to pay out, and to increase transparency. In its preliminary conclusion the European Commission named 13 of the world's biggest investment banks including, Goldman Sachs, JP Morgan, Deutsche Bank and Barclays. It has also named the industry association for derivatives itself, the International Swaps and Derivatives Association (Isda), which comprises all of the major banks, as well as financial data firm Markit. Isda sets the legal standards for CDS, and determines when contracts should pay out and by how much. "It would be unacceptable if banks collectively blocked exchanges, to protect their revenues from over-the-counter trading of credit derivatives," EU Competition Commissioner Joaquin Almunia said. The banks can now examine the findings and prepare a response. If the authorities are not persuaded by their defence, the Commission can impose a fine of 10% of the company's annual turnover.